4 ingredient dark chocolate cookies! I am a huge fan of peanut butter cookies so when I came across these 4 ingredient dark chocolate dipped peanut butter cookies on pinterest I had to make them right away! The 3 ingredients for the cookies are peanut butter, dates, and eggs with the dark chocolate for the dip being the fourth ingredient. I was super curious to see how they would turn out! 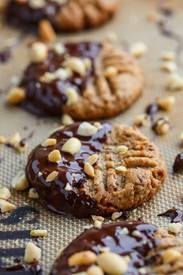 They are so easy to make, you simply puree the peanut butter and dates until smooth and add the eggs, for into cookie and bake before, optionally, dipping in the melted dark chocolate. As far as peanut butter cookies go, these 4 ingredient dark chocolate dipped peanut butter cookies are really good! The date sweetener is very nice, combo-ing so well with the peanut butter and the chocolate! They are also healthier than regular peanut butter cookies so I will be making these peanut butter and date cookies a lot!